Pithisaria & Pithisaria on Direct Tax Circulars, is a very valuable extension to Chaturvedi & Pithisaria Income tax law. It is the most reliable, authentic and thorough coverage on the subject. 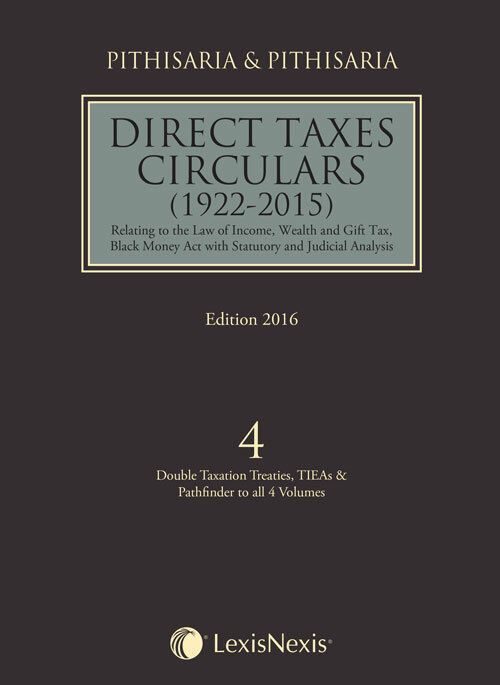 The series takes into account the latest statutory amendments and case law from the period 1922-2015 on income tax, wealth tax and gift tax, and includes editorial notes along with statutory and judicial analysis, with an exhaustive volume-wise Subject Index and a consolidated Table of Cases. The instant edition provides a lot of innovative information which are not easily available at one place. No stone has been left unturned to present this new edition in an accessible form and it is hoped that it will prove to be a useful guide to all legal professionals dealing in direct tax laws. It provides exhaustive discussion and elaboration of subsidiary legislative provisions on Direct Taxes expressed between the periods 1922-2015. This book covers large number of new Departmental Circulars, Clarifications, Instructions, Orders, Explanatory Circulars, Notifications, Press Notes, Press Releases, Press Communique, Press Report, Guidelines, Schemes, Regulations, etc. issued by the Central Board of Direct Taxes (CBDT) and Ministry of Finance on the subject of Direct Taxes, progressively reported in (2015) 379 ITR (complete) as also in Taxman, CTR, etc. The new Circulars, Notifications, Instructions, Orders, Press Releases, Guidelines, Schemes, Regulations, etc. are not only inserted or added at relevant places, but the existing subject matter is also thoroughly revised as and where necessary. The series also contains judicial pronouncements progressively reported in (2015) 379 ITR (complete), CTR, Taxman, ITD, (2015) 174 TTJ, etc.